The following are some examples of ring designs that we can do or have already made at Astrogems. We always make sure that the ring is open in the inside back so that the gem touches the skin. To do this properly the gemstone must protrude a millimeter or so into the skin of the finger . How much exactly will be based on the sharpness of the stones point and the size of the ring. This is something that we have much experience with. 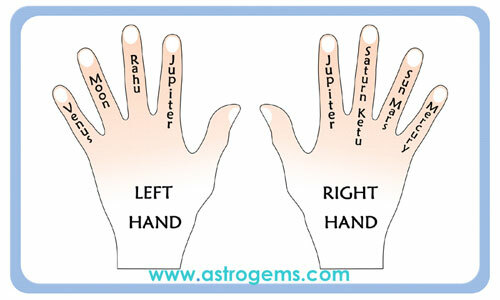 Most jewelers just simply don't follow instructions about making astrological jewelry as they simply can not overcome their prejudiced preference for setting a gem that is recessed or not touching the skin well enough. All of our rings are made by hand from lost wax casting and can be made in whatever metal you prefer. We advise gold rings to be made from 20kt to 22kt gold as the purer metal also has an ayurvedic benefit. Some clients prefer white gold over silver. Please understand that to make a customized ring the workmanship alone can cost from $100 to $350 depending on the complexity of design and the cost of the casting metal will be an added expense. With the navaratna arm bangle the setting cost of the gems will cost from $28 to $50 depending on the design. So the nine gem bangles are a lot less expensive to make per gem setting cost than a ring. And we often make a bangle with just one stone and have a the customer add more stones to it at a later date as thier budget allows. To have a ring made. All you need to do is tell us the number of the ring on this page and we can give you a quote . Astrogems has made a special ring sizing chart if you are from one of the countries that has a different ring sizing system to the USA. To see this chart please CLICK HERE. To see which Astrological ring gemstone would help you the most look for the first recommended stone in the Free Vedic Planetary Gem Analysis and Horoscope available here.